There’s a lot of good advice out there to avoid pitching prospects in dynasty leagues, for they just break their arms, their elbows, and your hearts. TINSTAPP has become an acronym as well known in dynasty circles as FIP, WRC+, WAR, etc. There is a lot of sage wisdom behind that, and it is the right strategy in the vast majority of circumstances. It’s also much easier and better for your mental health. But I’m here to tell you that pitching prospects are great and are worth investing in! As my colleague, Ryne Alber, said, “I’m sure if someone five years ago invested in Lucas Giolito, Julio Urias, and Tyler Glasnow they would be loving your advice right now”. Ryne is right: investing in pitching prospects (and pitching in general) is an easy way to become heartbroken, frustrated, and raging against the machine. That said, I think there are certain circumstances that merit investing primarily in pitching prospects. You need elite pitching to compete. Pitching prospects take longer to develop. Most hitting prospects aren’t that special. Differentiation is a good way to be successful. Let me preface with a few things: This is best done only in the context of a multi-year rebuild. If you want to retool or have a quick one-to-two year turnaround, then I would advise following the TINSTAPP philosophy. Avoid paying a premium for a pitching prospect or a young MLB hurler. If they come cheaply, go for it, but I wouldn’t go overboard. In a 30 team league, I traded Luke Weaver for Austin Hays, AJ Puk (before TJ), Carter Kieboom, Grayson Long, and Eric Lauer. That’s a lot of assets to move for a young promising hurler, and I’ve seen similar trades done fairly frequently in dynasty leagues. It’s a high-risk investment of your resources. Also, don’t avoid investing in potentially elite hitters. You need them too, but hitters that look to be mid-round assets are common and sprout up so often. Finally, you have to be patient, it’s going to be a long journey, one rife with loss. Also fair warning, I’m going to pick on Austin Riley a lot in the coming sections. Now, let’s dive into those points. 1- You need elite pitching to compete. In the vast majority of leagues, especially roto, you need to have elite pitching to have a chance at winning. You cannot win with mediocre pitching. This offseason you heard a lot about the Big Four and how important it is to have one of them on your roster. You also heard people talk about how quickly pitching talent drops off. Paul Sporer at Fangraphs coined it “The Glob.” There are a ton of mediocre pitchers, there are just so many options to choose from. There is a high replacement level in most leagues, even deep ones. That cuts both ways, because while you have depth to choose from, so does everyone else in your league. When I proposed this article idea, many of my colleagues said it’s not a good idea because replacement level is so high. One of them said, “you can find 38-year-old Rich Hill’s and 35-year-old Charlie Morton’s who are actually good pitchers and cost far less to invest in.” This is absolutely true, but there aren’t that many of those type of pitchers, everyone in your league is looking for them too, and they really aren’t that far from “The Glob”. They’re not going to be a reason you win your league. Additionally, last year six of the top ten fantasy performers were pitchers in standard leagues (Kluber, Scherzer, Sale, Kershaw, Jansen, Kimbrel). A few months ago, I wrote about the changing pitching landscape and advised targeting high-upside guys. That’s still true, and you should do that with minor league pitchers as well. Teams that have Noah Syndergaard, Luis Severino, or Aaron Nola are well set for the future with a young ace. If you’re able to get in on the ground floor for a guy like that, you’ll be set. That’s very challenging to do, and will be a painful road with dozens of dart throws in hopes of something that might not come to fruition, but if you’re able to find success, you’ll set yourself up well. Imagine if you had two…or three…of those guys; you would be in an enviable position and still be set if one of them became injured. You might be able to do it with patience and a pitching-oriented rebuild plan. 2- Pitching Prospects take longer to develop. Generally speaking, pitching prospects take longer to develop than hitting ones. I don’t even necessarily mean in the minor leagues. Pitchers go through adjustment periods in the big leagues too. Zack Godley, Luis Castillo and Luke Weaver are going through them right now. Luis Severino, after a flashy debut, had a long rough patch before turning into an ace. It is far more common for pitchers to go through prolonged developmental patches before turning into a star than it is for a hitter. Scherzer and Kluber both had some years of mediocrity before turning into aces. Young pitchers need time to develop. Buy low on some young names with intrigue, invest in high upside pitching specs, and be patient. It can pay dividends. 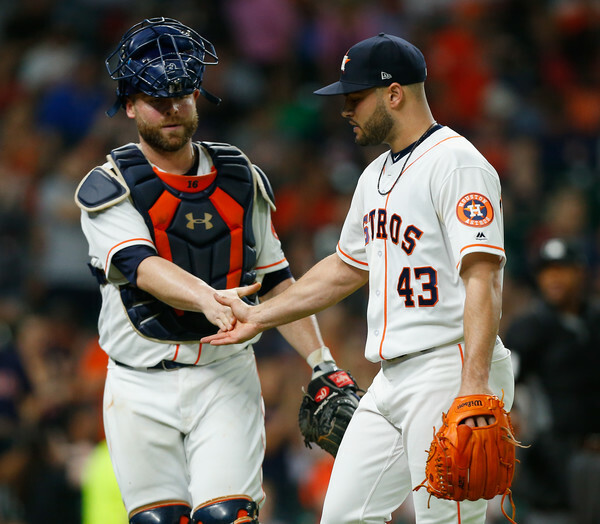 If, after this season, you choose to go into a multi-year rebuild, you could invest primarily in talented pitching, let them develop in 2019 and 2020 until you have the makings of a young pitching core. Let them overcome injury, take their lumps, and turn into a good core. Then in 2020 and 2021 begin investing in your offense with the rest of your pitching prospects that didn’t develop as hoped or succumbed to injury. Then in 2021/2022 you have a young pitching core ready to compete with a young hitting core on the rise. If you invest in hitting first, you could “waste” the first few years of good young hitters on a team that isn’t quite ready to compete because your pitching isn’t there yet. If you do it the other way around, you can maximize your window by giving your pitching time to develop. 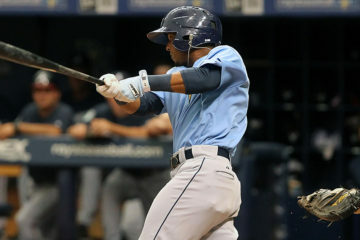 3- Most hitting prospects aren’t that special. Yes: Ronald Acuna, Vladimir Guerrero Jr., Juan Soto, Victor Robles, Eloy Jimenez are really special and the type of prospects you want in every league. There are some prospects that have a lot of helium that really aren’t that special though, and are the type of prospect that will have a similar version of them prop up in a few months that really isn’t all that different. My go-to example this offseason has been Austin Riley. Riley is a good prospect, and one that has tons of dynasty value if you don’t have a great long-term option at third base and are currently competitive or your window is opening soon. But, if you’re in a long rebuild he really doesn’t have that much value to you. A reasonably optimistic outlook for Riley is someone who hits .270-.280 with 30-35 home runs. That’s a good player, and if you can have him at third for the next decade-plus, that’s a strong investment. But, are those numbers really that amazing in today’s game? In 2017, Mike Moustakas hit .272 with 38 home runs…and was only the 14th best 3B in fantasy. Moustakas’ run production was relatively low, but that just shows how much talent there is on the offensive side in baseball. Is it really worth getting all hot and bothered over someone who might be a top 8/12 option at their offensive position? Especially when next year there will probably be a new Austin Riley (looking at you, Hudson Potts). If you’re in a long rebuild, you can find someone close to Riley’s value when you’re ready to compete fairly easily. This year Colin Moran and Jeimer Candelario were rather cheap to acquire and can be cheap versions of what Riley might be. So why use a roster spot on a good but not game-changing piece when you can shoot for more upside? Like a talented pitcher who could become better than “The Glob”? 4- Pitching prospects are cheaper. 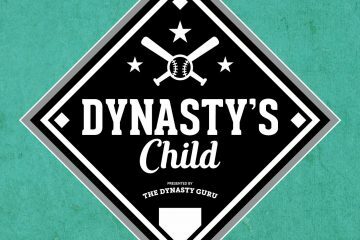 In today’s TINSTAPP world, there are a lot more pitching prospects available in dynasty leagues, and they come a lot cheaper in trades. It’s a lot easier to find top-tier pitching upside than hitting upside. You have a much larger player pool to dive into, it’s easier to acquire top tier talent in trades (again, wouldn’t advise overpaying, but pitching specs often come at discounts). There is just far more opportunity to invest in pitching than there is for hitting. 5- Turnover and roster flexibility are valuable in a rebuild. It’s also easier to move on from pitching prospects to open up roster spots for other acquisitions, especially when your prospect struggles to produce, has tommy john, or just doesn’t show enough upside. It’s easier for most owners to move on from Tyler Glasnow, Yohander Mendez, Tyler Beede, Jason Groome, etc. than it is to move on from Lewis Brinson, Corey Ray, Kyle Lewis, etc. Being able to move pieces and have roster flexibility is really helpful when you’re rebuilding. Keeping a roster static can hurt trading opportunities, picking up rising specs, etc. The general advice of “zig when others zag” applies to fantasy sports as well. No one invests heavily in pitching prospects. Being different gives you more opportunities to be successful. I can belabor this point, but you can find plenty of articles on this point. I am employing this strategy In a 20 team, 45 man roster, keep 28 player league. I joined the league this offseason, and with my initial roster kept 18 hitters and 10 pitchers. After looking at the landscape of the league, I decided to employ this strategy. If the season ended today, I would probably be keeping 14 of each. I hope to continue making trades and have that number this offseason be closer to keeping 18-20 pitchers, and 8-10 hitters. Then use the draft to gamble on upside hitters and see which of those pay off and deal with the inevitable pitcher melt. We’ll see how it works out for me. Let me know what you think about the strategy. Kyler is a college admission counselor, currently residing in Rhode Island. An avid fantasy baseball player, Kyler has experience in deep leagues. The smallest league he currently plays in rosters 900 players. He has played in traditional 10/12/14 man leagues, both head-to-head and roto. With a wide array of interests, Kyler plans to dive in deep to a variety of topics, but primarily focusing on vouching for unheralded players. Good article! Very interesting take on a rebuild. I recently took over a team that isn’t that great, sorely lacking starting pitching. 10 team h2h points starting 10 off and 7 pitchers, with 8 bench and 15 minors. I traded some offense for several draft picks when I took over the team and acquired Vlad, Soto, Tatis, Kingery, Bichette, Adames, Riley, Robert, Adell, and a few other high upside hitting prospects through draft and trade and now I’m considering just rebuilding completely. So I’m left with a decent offense with guys like Benintendi, Abreu, S. Perez, J Turner, D Murphey, Segura, and a bunch of closers in Kimbrel, Diaz, Ozuna, Knebel, Hand, etc. I’m middle of the road right now at 4-3. I’ve started picking up minors pitchers when I call up a stud like Soto, so I’ve picked up Beeks, Corbin Martin, and A Espinoza in the last few weeks. If I just cash in my money guys throughout the year, do you think I should target minors pitchers that are more established then? Most of the top 200 are taken already so I’ve been after high upside guys. Pitching is a premium in this league. Thanks for the article! Hi Jason, Thank you for the compliment and for providing such detailed context. You seem to have done an excellent job with your rebuild. I think since you’re near the end of your rebuild you don’t need to go out of your way to invest in minors pitchers. You know your league best, and part of my answer hinges on what you mean by your league places a premium on pitching. Just as a thought exercise, I consider Bo Bichette and Forrest Whitley to be really close in dynasty league value without discounting a pitcher’s value due to increased risk of injury/lesser chance of translating performance etc. Who do you think would get more in a trade? If the answer is Bichette I would probably lean towards picking up hitters in your minors slot. There are plenty of talented pitchers outside of Jesse’s top 200 I’d consider, so if you get to that point let me know and I’ll happily share some names of guys I am monitoring. I am in a rebuild in a fairly shallow dynasty 10 team with 30 many rosters and 10 Milb spots. I currently have Rodgers, Urias, Riley, Florial and Monte Harrison as hitters and Chance Adams, Alcantara, Morejn, Yadi Alvarez, and Faedo for pitching. would you say i am adequately invested or would you trade a Riley or Florial to add another less risky arm? Hi Jonathan, thanks for the question. Given your league and team context I’d only move Riley or Florial if you’re getting a pitcher whose ceiling is in a higher asset class. To use your team as example, I don’t know if I’d trade Riley or Florial for any of your pitchers at the moment. If you were able to move them for someone like Sixto Sanchez, Mackenzie Gore, Hunter Greene, AJ Puk (I love him but his surgery risk is significant), Jesus Luzardo, Alec Hansen, etc. I would consider it. Unless you’re able to take advantage of the “pitcher discount” I don’t think you need to go out of your way to move any of Riley/Florial/Harrison etc. I play in a 24 team scoresheet league rostering 50 players each saving 13 MLB players and as many MiLB as you want (up to 40). I started a similar style rebuild last year when I realized I had just a few good players on my team…and the two best were aging pitchers…Greinke and Darvish. I traded the pair to a contending team for Berrios, Acuna, Urias, and Soto (obviously pulled the trade early in the ’17 season). For the drafts since then, I have focused on MiLB players specifically for the drop-ability/minimal investment you mention above. And I have drafted a few interesting prospects (Walker Beuhler, Joey Lucchesi, Sixto Sanchez, Jesus Luzardo, and Micheal Pineda plus a bunch of young guys). The challenge I have seen is how to find the 1st or 2nd year pitcher that is about to break out without much in past performance…’18 case study is Nick Pivetta…so the rebuilds can take even longer because you are drafting many to find ‘the one’ but others are doing that too….plus you risk dropping a future potential ace because they have given no indication they have ‘ace in their future…again ’18 Pivetta. I will say this method is more fun though…draft and follow is better than middle of pack team performance that never seems to improve…there is the dream of contending. The big question I have right now…how/when do I transition from rebuild to contending?…waiting until I find several star players performing at elite levels may never come, so turning future promise into real production today also has to be part of the plan. Thank you for your detailed comment, and I appreciate you letting me know about the problem with my email link. I’ll make sure to fix that soon. To preface my answer, I personally have never played in a scoresheet league so I am unaware of some of the nuance in that system, but for me the time to know to switch to a rebuild is best done by surveying your competition and knowing your league. If you think with some maneuvering you could move your roster to the top 6-10 or so you should start maneuvering towards competing. If you only think you can be a middle of the pack team, I’d recommend a little more patience. Obviously the dream is to have Acuna, Vlad, Soto, and others come up and go amazing at the same time but that never happens as easily as it sounds. It also can be challenging to get the supporting infrastructure around those guys, because as good as they will be you still need a complete roster. So for me personally, I recommend using your minor spots to shoot for upside, especially in pitching, but using your mlb roster spots to get some underappreciated guys that are cheap to acquire that can be useful infrastructure. To me a perfect example of that is a guy like Eugenio Suarez, he has had a starting role for a while, but was never that expensive to acquire, but has always been just solid enough that he can be a good supporting piece for when you’re ready to take the leap. Again it’s hard to be too detailed, and it’s hard to be objective. One of the problems I’ve always had with rebuilding is it is easy to become attached to prospects, to chase the next big thing, that you have an endowment effect on them and it can be really hard to transition to competing. I’m having that struggle right now. After years of rebuilding I am in first place in a 30 team h2h league, and have Victor Robles, Bo Bichette, AJ Puk, Austin Hays, Carter Kieboom and others in my minors and I’ve been struggling to deal them for more MLB help because I’m attached to them. So it’s just about knowing your personal tendencies, being able to remove yourself and be objective about your chances, and when your team is ready to be in the top 40% or so, start making moves. Your Nick Pivetta analogy is apt, and that is precisely why I think the best way to invest in pitching is too spend a lot of roster spots on it, because for a lot of reasons it is a crapshoot and complete luck. So if you diversify your portfolio and have more pitchers, you are more likely to “stumble” into the breakouts. Pitching is much harder to evaluate than hitting, which is largely why I think its best to start a rebuild from there, so you have that infrastructure ready to go when your hitting gets there. Email me anytime at kyler.jesanis@gmail.com.